Why choose Nuffield Health Leeds Hospital for my partial knee replacement surgery? At Nuffield Health Leeds Hospital, we're with you every step of the way. Following your knee replacement surgery, you'll have access to a qualified physiotherapist in hospital or at your local Nuffield Health gym. Your orthopaedic consultant will support and guide you from day one, overseeing your full recovery and rehabilitation. Private patients can use our car service to collect and drop you off after surgery. During your time in hospital, you'll stay in one of our relaxing private rooms with en-suite facilities. If you are suffering from pain and think knee surgery could be the answer, please contact us to arrange a consultation with one of our experienced consultants. 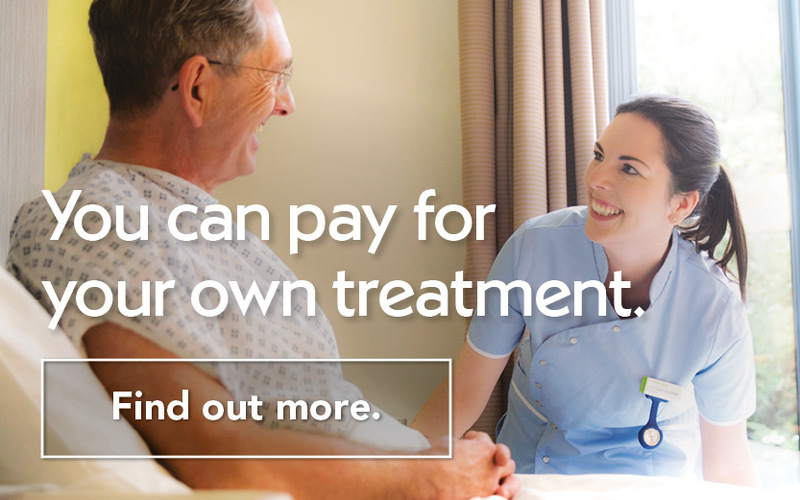 At the hospital, we’ll show you to your room where one of our Healthcare Team will meet you to explain each stage of your treatment and recovery. They’ll take notes on your general health, medical and surgical history and ask if you have any allergies. Your blood pressure, pulse and temperature will be taken and an identification band with your name and hospital number on it will be placed on your wrist. You will be shown where the alcohol hand rub is and how you and your visitors should use it. You will also see staff members using this before they treat you; please feel free to ask us if we have washed our hands. Don’t forget to wash your hands with soap after going to the toilet. Your consultant will come to see you. And if you haven’t signed a consent form already, you’ll be asked to sign one by your consultant. This is to confirm that you understand the details of your operation, the benefits and the risks associated with it, both during and after your operation. When it’s time to go to the operating theatre, our ward staff will take you. There, our theatre staff will take you to the anaesthetic room. If you are concerned about anything, please ask. We understand this can be a very stressful time. What happens during partial knee replacement? Partial knee replacement surgery usually takes between one and a half to two hours. The operation can be performed under general anaesthetic or spinal anaesthetic with sedation. Be sure and discuss your anaesthesia with the anaesthetist before your surgery. Your surgeon will make an incision (cut) in the front of your knee. They will examine all three compartments of your knee to confirm the damaged area. The damaged area will be removed and replaced by metal caps or covers. The caps will be held in place by cement. A plastic insert will be placed between the two caps to allow for smooth movement. They will close the incision with staples or stitches. You may also have a drip (infusion) going into your arm. This will keep you hydrated until you are able to drink, and can also be used to give you pain relief. When you are stable and comfortable, a nurse will take you back to your room. We understand that you may be anxious or worried about getting up, but we will do all we can to help and reassure you. Don’t worry, a member of our Healthcare Team will be there to help you, whenever you are ready. The reason for getting you moving is to improve your circulation and avoid stiffness. You may be feeling tender and sore, but you can get pain relief medication to deal with any discomfort - just ask one of the nurses if you have any pain. Once out of bed, you will continue to wear support stockings to help your circulation. The physiotherapists will work with you during your stay to help give you the best start with your new joint. Because partial knee replacement is less invasive than total knee replacement patients usually go home sooner and return to normal activities earlier. You may stay in hospital one to three days. Before discharge you will have an X-ray of your new knee to check its position. A physiotherapist will give you some exercises to help get your new knee moving. These are important to help you make a good recovery. The therapist will also show you how to walk up and down stairs and make sure you are confident at doing this before you go home. You won’t be able to drive, so you will need someone to come and take you home from the hospital. When you go home, you may need some help with shopping and household chores. It’s a good idea to arrange for someone to stay with you - or at least look in on you daily for at least a week. Everyone heals differently. You will continue to improve over the next six to eight months. Your scar should fade to a thin white line. Depending on what type of job you do, you should be able to return to work within eight to twelve weeks. You may want to think about a phased return to work. After your followup visit with your surgeon you should be released to drive but only if you can comfortably operate the pedals and control your car in all situations. This includes an emergency stop. If you are in any doubt about your insurance cover, it’s best to contact your insurance company. This treatment qualifies for Nuffield Health Recovery Plus Programme - this is a free-of-charge optional enhanced recovery programme that enables you to continue your rehabilitation at a Nuffield Health.